This episode has several major points. The first one I want to focus on is the idea of ‘training cycles.’ Each day with Jac consists of cycles that are physical and then mental/emotional. These are components of each workout routine. The simplest day would only contain one cycle. A longer day will repeat these cycles over and over. Something to notice is that each ‘physical’ cycle isn’t necessarily the same intensity. Often by the third or fourth ‘physical’ cycle the horse doesn’t feel as much like playing, so the cycle is less intense. I may accomplish four times as much in that day, but only work the horse half again as hard as I did in the first cycle. Did you follow that? So adding cycles, rather than extra days, can actually be physically easier and more productive in the long term. Consider the options of: physical or retraining. Have the physical checked out, even if it has been before. 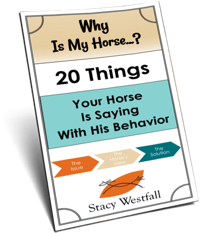 Then try doing what I did in the episodes and see if your horse responds similar to Jac; does the mouth get quiet when wearing the bit and being worked in the round pen without anything attached? I had some problems bridling my stud. He returned from the trainer’s afraid of the bridle. I tried this procedure on him. Now whenever I go to halter him he grabs the rope. I had good success with a rubber bit. Keeping the bridling process separate from the haltering process. He still grabs to rope when I halter him. How do I undo what I feel I taught him? I would discourage him grabbing at anything. Studs tend to be more prone to this although some playful horses will also try. For some of them it becomes a game. The grabbing is the issue more than the item being used. Discourage the grabbing. Stacy, this is probably my favorite so far in Jac’s Video Diary series. What are some examples of mental/emotional cycles you would use for a seasoned horse like Newt verses a green horse like Jac? Thanks for doing this series; it is incredibly helpful! 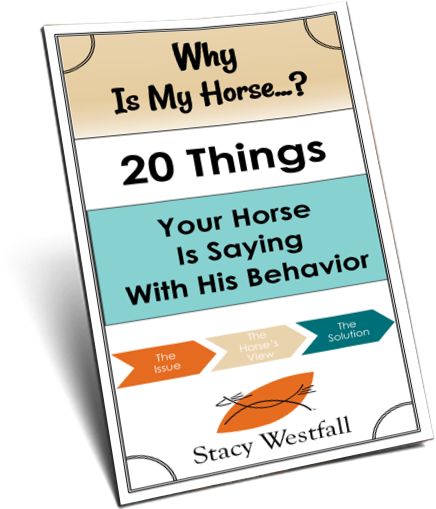 Wow – I have never been able to understand horse training as easy as this. You are a natural and with simplicity to boot. I will follow your blog. I like how you explain things. Thank You. I really like this format! I was able to read the notes above, then watch the video looking for those key points, then review those points after watching. In this series I also really like you explaining what Jac is thinking and your thought processes paralleling his. Thanks for this whole series Stacy. May I ask you, why Jac is kicking out against the girth? Mine are very stressed horses when I get them, but the first time I put a girth or saddle on, there is not such a reaction. I always watched your videos and was really really impressed by that bridleless ride. But some things in this blog do not make alot of sense for me. So maybe I dont pick everything up the right way or it migh be not explained precisely enough. Sabine, Not all horses kick out during this test. Jac probably chose to because he is willing to test things. If you watch him in Episode 12 with Popcorn, Jac keeps picking and testing. He wasn’t scared when he was kicking which we can see by reading his body language. It might help to know that the training does always look a bit different from horse to horse. Even the other filly I was starting at the same time as Jac didn’t respond to things in the same way. And I changed what I did accordingly. I am sorry that some things in this blog do not make a lot of sense for you. It might be that my teaching style is not a good fit for you or it might be that as you continue watching you will pick more things up. Or maybe you understand and don’t agree…that is OK too. Can you give some more examples of emotional cycle activities? And maybe explain (again) how you know what you are doing is an emotional vs. physical cycle? I wish, for all the horses out there getting started, it’s just like this. (nice fantasy) My wish might come true one day, if people like you keep taking the time to help others. Thanks for caring enough to share.